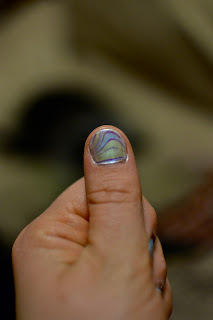 I tried the water marbling of the nails. It turned out great. It is not perfect, because I sucked at painting my nails underneath but I think it looks pretty cool! It was very easy, but time consuming. So sorry to hear about your friends. I will definitely be praying for them. how do you do this look?